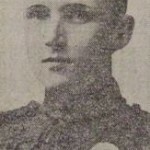 Home / Posts Tagged "Private Patrick Bannon"
WW1 Centenary: Ulster men killed at the Battle of La Bassée. By 22nd October 1914, the 2nd Battalion Royal Irish Rifles had been at the front in France for 70 days. In that time, they had suffered 94 fatalities. In the following five days they were to lose nearly exactly double that figure – 186, in the vicinity of a northern French village which was to become the scene of a vicious set piece battle in the spring of 1915 – Neuve Chapelle. Amongst the rank and file who fell in this period of savage fighting were three men from West Belfast. 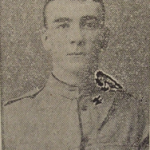 First to die on 25 October 1914 was 24-year-old Private Patrick Bannon. Patrick was the eldest son of Peter and Mary Bannon, who were originally from Cork, Patrick himself was born in Monaghan. Both parents worked in the flax mills and the family lived at Milton Street in the lower Falls area. Patrick had been with the battalion in France since their arrival on 14 August and had seen much action in that time. In common with the two other West Belfast men highlighted, Patrick has no known grave and is commemorated on the Le Touret Memorial to the Missing. The following day, on 26 October 1914, 29-year-old Private Robert James Foley was killed. He was the son of Patrick and Mary Ellen Foley who at the time of his death resided at 59 Servia Street with Patrick’s sister Maggie who worked in a linen mill. In 1911, the family resided a short distance away in Plevna Street. Patrick had been at the front for just over two months before his death. War, he received the South Africa medal with clasps for service at Cape Colony, the Transvaal and the Orange Free State. Returning to civilian life, he worked as a dock labourer before re-enlisting on the outbreak of war. In 1911 his home was recorded at Johnston’s Court off Durham street, where he resided with his wife, Catherine and his daughters Catherine and Mary – both under six years old when their father was killed. The family had also lived at Bank Street and Berry Street, close to the city centre. Private Lavery had been at the front for only six weeks before his death. Of the five officers who died, two had connections to North Down, and Campbell College. Lieutenant Vivian Trevor Tighe Rea, was born in Mendoza, Argentina in August of 1891. An only son, his father was a steamship broker and the Vice Consul in Belfast for the Netherlands and Argentina. He was educated at Campbell College Belfast from 1905-1908, where he held a scholarship before going to Queens University, and then Trinity College Dublin where he studied for the Church. In a change of career he enlisted in the Royal Irish Rifles attaining the rank of Lieutenant in 1913. On 25 October 1914, Lt Rea was severely wounded in the front line. He was removed to a Chateau behind the lines where the Battalion medical facilities were, but succumbed to his wounds. He was buried in the grounds of the chateau, but that same night the Germans heavily shelled the area setting the chateau on fire and destroying it. His remains were exhumed and identified in 1921, and re-buried in the Guards Cemetery (Windy Corner) Cuinchy a short distance from Neuve Chapelle. His father arranged for his headstone to bear the inscription, ‘I have fought the good fight.’ In a very busy life cut short, Lt Rea was also a leading light in the nascent Boy Scouts movement, being scoutmaster of the Bangor Troop and Honorary Secretary of the Ulster Scout Council. In a mark of appreciation a stained glass memorial window was erected in his memory at St Comgall’s Church of Ireland, Bangor. Another Old Campbellian to fall two days after Lieutenant Rea on 27th October 1914 was Captain Henry Ousely Davis. Born at Church Road, Holywood in September 1884, he was the eldest son of Henry and Mary Davis. He initially attended Portora Royal School Enniskillen before moving to Campbell College in 1901. 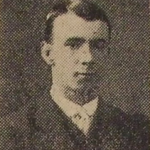 He remained there until 1903 and played rugby for the school First XV. He entered Sandhurst in 1903 and was commissioned into the Royal Dublin Fusiliers in 1905. He resigned his commission in 1910 and appears to have become heavily involved with the UVF, becoming a member of its Headquarters Staff. In that capacity early in 1914 he approached Campbell College asking if its facilities could be used as a hospital in the event of civil war. 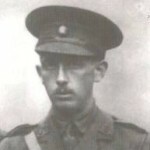 At the outbreak of the First World War he re-enlisted in the Royal Irish Rifles. 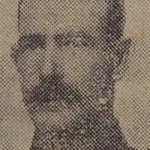 Captain Davis was killed by shrapnel on 27 October 1914, and in the confusion of battle his body was never recovered. In 1921, his family received correspondence from the Imperial War Graves Commission asking for a description of Henry as they intended to open a grave to try and obtain and identification. Sir Edward Carson became involved in the matter, but no positive identification was ever made. Captain Henry Ousely Davis is commemorated on the Le Touret Memorial to the Missing, on a plaque in Holywood Parish Church, St Philip and St James. Both men are commemorated on both the Campbell College Roll of Honour and the North of Ireland Football Club Roll of Honour. The 2nd Battalion Royal Irish Rifles came into being following the reorganisation of the British Army in 1881. The amalgamation of two historic regiments – the 83rd (County of Dublin) and the 86th (Royal County Down) Regiments of Foot, formed one of many two battalion Regiments in the army – the 1st and 2nd Battalions Royal Irish Rifles. The regimental depot was located in Belfast at Victoria barracks which stood where the New Lodge is now. The main barracks entrance was at Henry Place which still joins with Clifton Street. At the outbreak of the First World War, neither battalion had spent any meaningful time in Belfast since their formation, globetrotting being the norm with the 1st Battalion posted to South Africa, India, Burma and Aden, and the 2nd Battalion spending time in Bermuda, Canada, Gibraltar, Egypt, Malta and India as well as South Africa for the war at the turn of the century. When war was declared however, they were in the less glamorous surroundings of Tidworth in Wiltshire. Well below their active service strength of 1,000, the 2nd Battalion received 224 reservists from the depot in Belfast before embarking for France as part of 7 Brigade, 3rd Division of the British Expeditionary Force, arriving at Rouen around teatime on 14 August 1914. The morning of 25 October saw another attack by the Germans which breached the Rifles defences for a time until reinforcements from the battalion were able to force them out, again sustaining many casualties. More galling for the Rifles was the fact that they came under heavy shelling by British artillery which took some time to stop as it was impossible to communicate with the gunners due to the telephone wires being cut. On 26 October, the Germans broke through the Rifles line in a massed attack and two Companies, B and D simply disappeared, either killed or captured. The remaining exhausted Rifles, dwindling in number managed to rally and once more force the Germans back, but on 27 October were forced due to overwhelming enemy numbers and firepower to withdraw to the village of Neuve Chapelle itself. Research by History Hub Ulster Associate Member Michael Nugent.